Scooper - Technology News: Landfill mining: is this the next big thing in recycling? For more than 100 years, the world has been discarding its unwanted waste in landfill sites. There are at least 500,000 of these sites in Europe alone, according to estimates by the European Enhanced Landfill Mining Consortium (EURELCO). Only some are still operational. What concerns many experts is that a lot of these landfills are located in semi-urban environments. 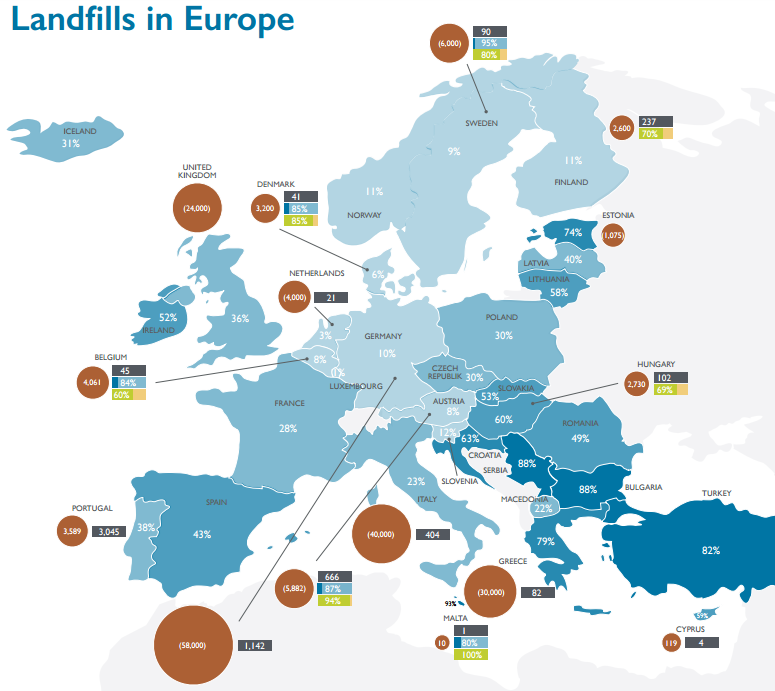 In Europe, fortunately, most of the still-operational landfills are so-called “sanitary” landfills, which are equipped with state-of-the-art environmental protection and gas-collection systems. It means that for these sites environmental pollution and release of greenhouse gas emissions from these landfills are avoided. But this still leaves a good 90% in a “non-sanitary” condition. These landfills, which generally predate the EU’s Landfill Directive of 1999, have little or no protection technologies. The situation is no better elsewhere in the world: the vast majority of landfills in regions such as Asia and Africa are downright “waste dumps”. These deposits could cause serious environmental problems, ranging from local pollution concerns (health, soil and water) and land-use restrictions to global impacts in terms of greenhouse-gas emissions. Landfills are one of the major sources of methane emissions, a notoriously powerful greenhouse gas. The “do nothing” scenario is not an option, as politicians and other stakeholders agreed at a landfill mining seminar organized by the European Parliament and EURELCO in 2015. For the thousands of waste dumps beyond Europe, the same conclusion can be drawn. But remediation measures are pricey and environmentally risky. It costed Flanders’ public waste agency, OVAM, €80 million to excavate and move hazardous waste to state-of-the-art sanitary landfills between the years 1993 and 2001. For most of the EU member states – not to mention developing countries – costs like these are prohibitive. However, by combining landfill remediation with resource recovery of the excavated waste, the net cost of the remediation activity can be drastically reduced. How? By generating recyclable goods and energy (carriers), all of which can provide much-needed revenue to counterbalance the cost of remediation. In fact, if landfill mining followed the principles of the “enhanced landfill mining” approach, where higher added value outputs are targeted, the net economic balance of the combined remediation-landfill mining activity can even become positive, which is especially the case for larger landfills where economies of scale become relevant. As such, remediation combined with enhanced landfill mining can generate an income for public waste agencies, and this can then be used to cover the costs of remediating and mining smaller, less economic landfills that pose short-term environmental and health risks. Officially defined as “the integrated valorization of landfilled waste streams as materials and energy”, enhanced mining extracts valuable materials from both landfilled industrial waste and municipal solid waste. Industrial residues arise during the production of aluminium, zinc, copper or steel. In many cases these residues contain significant quantities of metals that are short in supply and that are central to the development of clean technologies, such as photovoltaic cells, e-cars or wind turbines. Enhanced landfill mining is also relevant for municipal solid waste. In this case landfill mining separates waste into directly recyclable materials (glass, plastic, metals, aggregates) and a refuse-derived fuel fraction, which is further converted into high-added-value products. Using the new plasma gasification technology, it is possible to transform this refuse-derived fuel fraction into hydrogen and a mineral residue fraction that is then upcycled into a green, low-carbon cement. The enhanced landfill mining approach is currently being demonstrated in two flagship projects funded by the European Commission’s Horizon 2020 Programme, ETN NEW-MINE (for municipal solid waste) and METGROW+ (for industrial waste). This sort of mining can transform landfills, particularly those in urban environments, from a threat and a cost, into an opportunity for resource recovery. It closes the loop, injecting additional resource circularity and resilience into the economy. As primary resources become scarcer and external costs are increasingly internalized, the possibilities for landfill mining are set to increase. But first, legal frameworks need to be created that allow landfill mining to prosper in harmony with local residents living close to the targeted landfills, who need to be integrated right from the early stages. And local job creation, in both high and low skilled roles, should be recognized as a crucial benefit. We need to change the way we think about landfills. They should no longer be considered as static end-stations for obsolete materials, but rather as dynamic resource reservoirs to be unlocked. This is a paradigm shift which has recently also been endorsed by the European Parliament, with its formal approval in 2017 of the so-called “waste package” . The future for landfill mining looks bright.